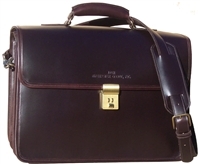 Custom-made Leather Briefcases and backpacks made in USA by Custom Hide. 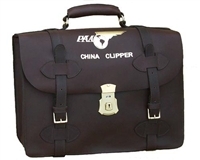 The true beauty and convenience of a customized leather briefcase is that you can make it work for you in a way that a premade bag can't match. 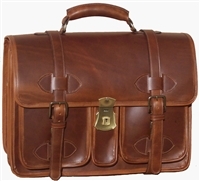 We offer a range of classic and contemporary styles, so whether you love the look of an old-school 1945 Army briefcase or prefer something reminiscent of a modern-day professor at an esteemed university, we've got you covered. Every individual has their own working and organizational style, and your bag should work in tandem with that style. Whether you need an extra pocket, a wider storage space, a laptop compartment, or corporate embossing, we craft leather briefcases that get the job done. Not only will the end result be a fine piece of leatherwork that will last you for years to come, it will also be backed by our lifetime warranty. Any of the existing products on our site can be customized, so if something catches your eye but isn't quite what you need, please contact us. We'll customize anything from a leather briefcase to a gun holster. Our warranty covers hardware, zippers, and workmanship for as long as you own your leather product, and all our work is proudly hand-made in the USA. Call us today at 480-278-1801 to get started. What makes us unique is, our ability to produce an individually customized leather briefcase built to your exact specifications. So instead of having to settle down for a case where the details have already been predetermined, simply have one custom-made to fit your needs. There is no other word to describe my new scholar briefcase from custom hide. It is the absolute best. You handled the special custom detail of nickel plated hardware with a quality unheard of by literally every other case I've looked at. This has been a long quest but the search was worth every second. I'm buddies with the man who owns Brooks Brothers and simply cannot wait to show him my web find! As editor in chief of a magazine extensively devoted to style and quality I look forward to showing off my Scholar to all my fashionista work cohorts. My only problem now is figuring out now how to justify getting another custom hide product. Perhaps a backpack version of one of the ranger cases is my next option. I've also seen testimonials requesting that you get into other leather products. I second that emotion. Thanks again for a case well done! I just wanted to let you know the briefcase delivered yesterday. I want to thank you and your employees for all their had work. I am very happy with the briefcase, it came out better than I had hoped. I know that I will enjoy carrying it for many years to come. Thank you for your patience and kindness in answering my questions and concerns. I will recommend Custom Hide to anyone I know looking for a new briefcase, not just for the quality of your product, but also for your outstanding customer service. Thank you so much and all the best.